Mexican student protestor massacre: Cartels and law enforcement may have conspired. Soldiers near the site of the mass grave. 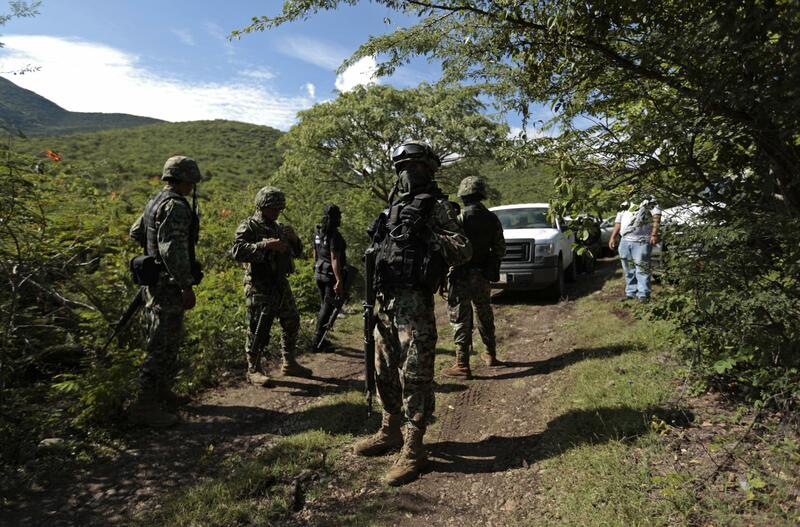 Police infiltrated by local drug cartels are suspected of abducting some of the students, a local security official said, speaking on condition of anonymity.”You really can’t call them police,” the official said, standing on the hillside above Iguala. The security official said suspected gang members had told investigators that police had handed over the students to the people who killed them, who belonged to the gang. 43 students from a teachers’ college in the city of Iguala went missing after a protest—which was apparently related to contentious education reforms and not to drug crime—on Sept. 26. In the days since, 22 police officers from Iguala (which is about 120 miles from the resort town of Acapulco) have been since been arrested. The whereabouts of the city’s mayor and head of security are unknown and they are considered fugitives.